Fiji Tourism Information - Need a one-stop-shop of tourist information? Need all the tourist information in one place before you jet set? Well... here it is! The remote island nation of Fiji is a Melanesian republic located in the South Pacific. It consists of 332 islands of which approximately 110 are inhabited. They are divided into 9 Fiji islands groups. Fiji's population of around 896,000 live mostly on the 2 big islands of Viti Levu and Vanua Levu. The capital Suva is on the main island of Viti Levu. However most visitors will come to Nadi International Airport (NAN). Fiji tourism is the backbone of the Fiji economy. Need to know some Fiji facts before coming? Find it all out here. One fact that you won't find here though, is that Fijians are the friendliest people in the world! Need to find the important information before arriving in Fiji? Discover here on our Important Travel Fiji Information page from travel Fiji tips to health information to the nation's customs and culture. Are you wondering how much money to budget? This information is found on our Fiji Information Budgeting page. The best times to go, and not to go, amongst other things is covered in full on our When to go Fiji Islands Vacations page. From visas to wedding rings, find out here on our What to Bring on Vacations to Fiji page. 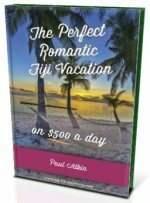 What to do in Fiji? Explore all the things you can do in Fiji right here. Of course, many elect to do what we really came here to do... to completely relax. This usually means doing almost absolutely nothing! Not sure what the time difference is? You've probably already noticed the time in Fiji clock to the right. Also, what is this 'Fiji time' that people talk about? If it's to do with time and Fiji, it's on this page. Here is the lowdown on Transfers from Nadi Airport. For all your domestic travelling information, visit our hub Transport in Fiji page. Start here for your options on Flights to Fiji. What are my money options in Fiji? How do I organise and access my money? Discover all you need to know about Fiji money matters to ensure that your holiday/vacation/trip goes smoothly without a hitch. Fiji tourism exists partly due to Fiji's stunning beaches. For a bit fun, read up on How to have fun on Fiji beaches! Is water safe to drink? Visit our Fiji water section for the lowdown. When are the public Fiji holidays? Learn about it here. It's a chance to check out how Fijians celebrate, giving you a wonderful real cultural insight. School holiday dates are thrown in for good measure. The list of potentially important information is found here on our Fiji Travel Information Embassies & Consulates page.